H. Rick Bamman - hbamman@shawmedia.com Trinity Gymnastics Coach and co-owner Jonathan Kivley (right) works with Christian Simpson. H. Rick Bamman - hbamman@shawmedia.com Trinity Gymnastics owner Chris Riegel (cq) speaks with a parent about class size and schedule at the facility in Lake in the Hills. 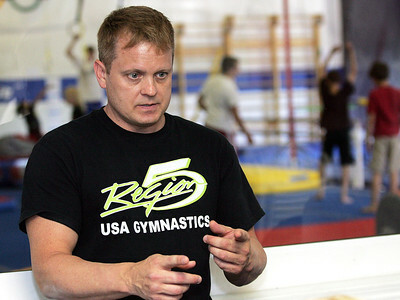 Trinity Gymnastics is expanding the location by 40% after being in business only two years. H. Rick Bamman - hbamman@shawmedia.com Trinity Gymnastics student Katarina Schmid practices on the beam as owner Chris Riegel (cq) (far left) and assistant coach Heather Morley direct other students at thefacility in Lake in the Hills. 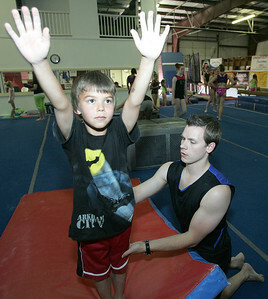 Trinity Gymnastics Coach and co-owner Jonathan Kivley (right) works with Christian Simpson.